The winter weather can take a toll on our grass in New England, making it particularly difficult for homeowners to grow a healthy lawn around their home. However, you can reverse the damage brought on by harsh weather conditions. It may seem like a lot of work, but it really just takes a little planning. Ultimately, caring for your lawn the proper way will help it grow under the best conditions possible. Once you finally see your grass again (which in New England may not be until mid-July) take a good look around. Inspect what is called the “thatch,” a layer of dried grass on your lawn. If that layer is deeper than half an inch, you need to air out your grass. Use a dethatching rake (a metal rake with fine teeth) to dethatch your lawn, raking lightly but vigorously. This removes dead grass, which if left untouched would keep your plants from getting the sunlight, oxygen, and water they need. Just like a bear, your grass hibernates during the winter. It also “wakes up hungry” from its hibernation. If you feed your lawn properly in the spring, it replenishes all the vital nutrients it lost over the past few months. If you know you had crabgrass last year, act fast to keep this from happening again. Simply use a product that combines a pre-emergent to nourish your lawn and ingredients to keep crabgrass from growing in the same spots. 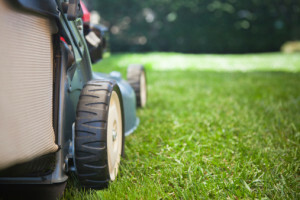 Generally, a good time to feed your lawn is around the first time it will need mowing. Your first impulse may be to water and mow your lawn right away. Instead, give it some time to grow first. This helps because the longer grass helps protects roots and makes it stronger overall. Don’t worry if your lawn starts out with some brown spots, though. This is completely natural, and will change once it rains a couple times. After that, water your grass twice a week. When you water your lawn, use sprinklers either early in the morning or at night to prevent evaporation. You should also move your seep hoses eight inches every thirty minutes. Pay attention to patches of grass that aren’t as springy as the rest of your lawn; they may need more water. Remember, you’re trying to make your grass lush and healthy for the coming summer, so when and how much you water your lawn is very important. You may want to get outside and mow your lawn, but it’s better to wait until the grass has started growing for a while. Doing it too early can agitate grass when it’s just starting to grow its roots. Instead, wait until your grass is taller than your mower blade by about an inch. Until then, avoid mowing or even walking on your lawn during wet weather. Once the grass has dried and grown out you can mow your lawn like you’ve been waiting to do. If there are places in your lawn that are bare or thinning, don’t worry! You just need to seed over it. Water your soil lightly and agitate softy with your dethatching rake. This will aerate your soil and prep it for your grass. Next, sprinkle your grass seed over the bare/thinning spots and cover with a quarter-inch of soil. Be sure to water those seeded patches two to three times daily. Your new grass is going to need the extra help. Acidic lawns are susceptible to weed and moss growth, so you need to check your soil’s pH levels during the winter. You can lower acidity it by applying limestone or ground chalk; just take care not to use much of it! For the best results, sprinkle about two ounces per square foot. You should also find an appropriate weed killer to apply in spring or summer, and repeat early in the fall. If you want to go organic, just remove weeds from the ground with an old knife. Winter can be tough on your grass, but restoring it to its natural luster can be easy if you follow these steps. For more information, read some of our helpful articles on our blog. Feel free to contact us with any questions or to request a free consultation from Greener Horizon.